4 Design Trends in Higher Education | Mahogany, Inc.
A popular trend for higher education design is allowing for space to move around within the classroom. When it comes to choosing a design for your higher education classroom, you want to pick a design that goes against what is commonly done. The last thing you want in higher education is for the design of your room to be boring and tasteless because it will impact the way your students feel while they attend class. If you are in need of a few design tips for your higher education classroom, check out these four design trends. A popular trend for higher education design is allowing for space to move around within the classroom. Allowing for room to move around in higher education can help keep students active and alert while they are being taught, rather than giving them the chance to fall asleep in their desks. This design also allows you to change the layout of your room more easily which can be beneficial in higher education. 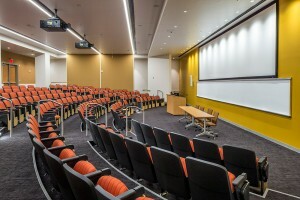 You also do not want cramp spaces that will make your higher education environment feel enclosed or like a trap that discourages students from getting up to participate. You can also use this space to move the design to encourage playing with the seating arrangement from time to time, which can also help encourage more collaboration amongst everyone in the future. Having areas for collaboration is extremely important for design in higher education. This is trending because it is good for students to learn how to work together. Not every task in life can be completed independently. A higher education environment is a good opportunity to teach people how to properly work together to complete a project together. To encourage collaboration, you will want your design to allow for desks to easily be moved together, or even already grouped together as if they were all just one big table. Furniture is also encouraged for higher education because it helps to create additional areas for collaboration in the design of the room. A lot of traditional classrooms have areas that rarely get any use out of the class. A design trend in higher education discourages this and will help your room as a whole become more flexible so the entire space can be used. Classes are getting bigger, and students will need more room to spread out and work in, especially in groups, so you will want to make sure that not a single inch of the room is wasted. Incorporating technology more into higher education classrooms is a major trend because of how much it can help with learning. Many students in higher education like to use their laptops to work on, so they will need areas to charge their computers when need be. Projectors that can be plugged into laptops will also be needed to help present videos and projects that can only be done with the use of a computer. This entry was posted on Friday, January 25th, 2019	at 2:40 pm	and is filed under Interior	. You can follow any responses to this entry through the RSS 2.0	feed. Both comments and pings are currently closed.